This is the most widely circulated recording and film of the band to date. The original soundtrack was officially released as Shepperton 74 in full form. The video footage was aired on various TV shows in different countries, and also portions were included on Easy Livin' - The History Of Uriah Heep. What made this recording relevant was the fact the audio was the first known source of this show before any official releases were to come out years later. The date listed is the official date of the filming, the TV broadcast date is speculated as September 30, 1974 at this point. 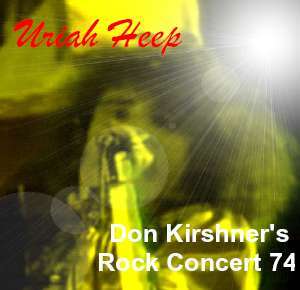 This was the first of three separate appearances made on Don Kirshner's Rock Concert broadcast in the United States. Many statements, good or bad have been made about this performance. The story of the streaker (listen to the sound file for So Tired), the rumors of Byron being intoxicated during filming since he forgot the words to Stealin' (yet put on quite a show), plus Lee jumping over his drums before they did the encore of the complete Rock N' Roll Medley. No matter what is written or rumored, this was classic Heep during the heyday of their long career. Better copies surface on this or that, it's mentioned here or there, but regardless it isn't forgotten!